*34 tracks newly re-mastered on a Deluxe 2xCD set with a hard-cover 120 page book with comprehensive liner notes, artist interviews, unseen archival photos, and lyrics (with translations)* "Largely unheard, criminally undocumented, but at their core, utterly revolutionary, the recordings of the diverse North American Aboriginal community will finally take their rightful place in our collective history in the form of Native North America (Vol. 1): Aboriginal Folk, Rock, and Country 1966–1985. An anthology of music that was once near-extinct and off-the-grid is now available for all to hear, in what is, without a doubt, Light In The Attic’s most ambitious and historically significant project in the label’s 12-year journey. 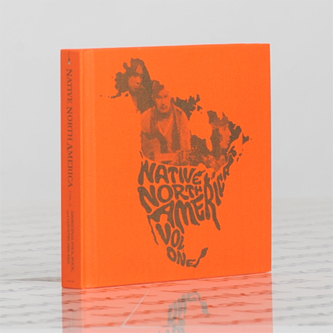 Native North America (Vol. 1) features music from the Indigenous peoples of Canada and the northern United States, recorded in the turbulent decades between 1966 to 1985. It represents the fusion of shifting global popular culture and a reawakening of Aboriginal spirituality and expression. The majority of this material has been widely unavailable for decades, hindered by lack of distribution or industry support and by limited mass media coverage, until now. You’ll hear Arctic garage rock from the Nunavik region of northern Quebec, melancholy Yup’ik folk from Alaska, and hushed country blues from the Wagmatcook First Nation reserve in Nova Scotia. You’ll hear echoes of Neil Young, Velvet Underground, Leonard Cohen, Creedence Clearwater Revival, Johnny Cash, and more among the songs, but injected with Native consciousness, storytelling, poetry, history, and ceremony. 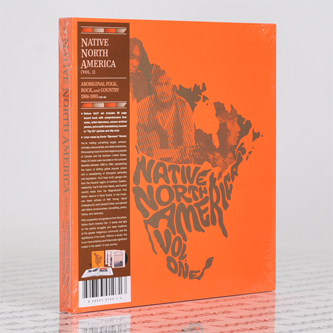 The stories behind the music presented on Native North America (Vol. 1) range from standard rock-and-roll dreams to transcendental epiphanies. They have been collected with love and respect by Vancouver-based record archaeologist and curator Kevin “Sipreano” Howes in a 15-year quest to unearth the history that falls between the notes of this unique music. Tirelessly, Howes scoured obscure, remote areas for the original vinyl recordings and the artists who made them, going so far as to send messages in Inuktitut over community radio airwaves in hopes that these lost cultural heroes would resurface. With cooperation and guidance from the artists, producers, family members, and behind the scenes players, Native North America (Vol. 1) sheds real light on the painful struggles and deep traditions of the greater Indigenous community and the significance of its music. The songs speak of joy and spirituality, but also tell of real tragedy and strife, like that of Algonquin/Mohawk artist Willy Mitchell, whose music career was sparked by a bullet to the head from the gun of a trigger-happy police officer, or those of Inuk singer-songwriter Willie Thrasher, who was robbed of his family and traditional Inuit culture by the residential school system. Considering the financially motivated destruction of our environment, the conservative political landscape, and corporate bottom-line dominance, it’s bittersweet to report that the revolutionary songs featured on Native North America hold as much meaning today as when they were originally recorded. Dedicated to legendary Métis singer-songwriter and poet Willie Dunn, featured on the anthology but who sadly passed away during its making, Native North America (Vol. 1) is only the beginning. A companion set featuring a crucial selection of folk, rock, and country from the United States’ Lower 48 and Mexico is currently in production."